1. 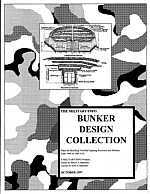 This book is a companion book to: Bunker Design (which is concerned with the design cut and cover bunkers) and Artificial Cave Shelters (which is involved with the design of tunneled bunkers). We just couldn't put it all in one volume.